I am so excited to share this Italian Wedding Pasta Skillet with you today, I’m totally obsessed with this recipe. 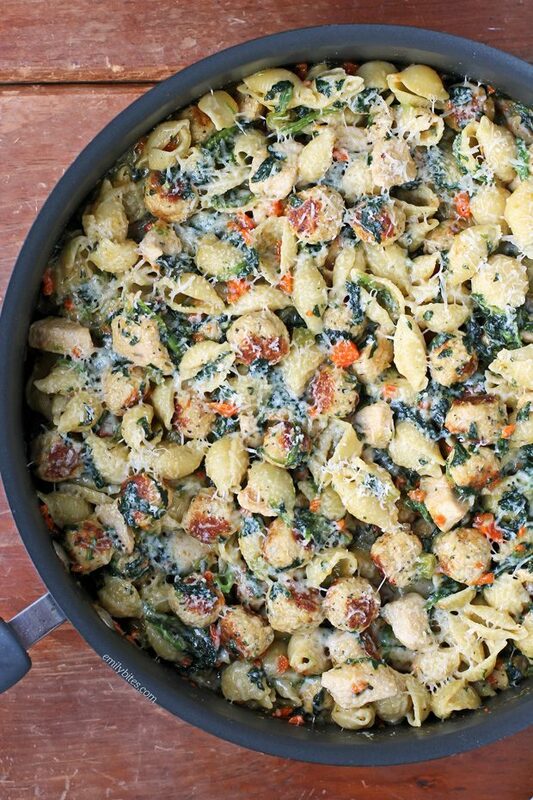 If you like Italian wedding soup or chicken noodle soup then this pasta skillet featuring all the same flavors is going to knock your socks off. 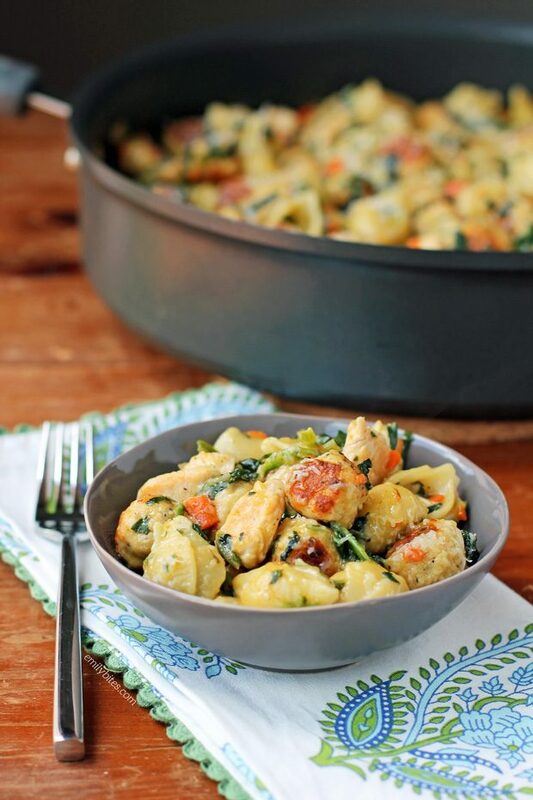 Mini meatballs, pasta shells, sauteed chicken, carrots, celery, spinach and onions all coated in a savory, flavorful sauce and topped with parmesan cheese – it’s pure comfort in a bowl. This dish also makes great leftovers and trust me, you’re going to be excited to eat this again the next day. I basically want to eat it all the time. Even better? Each serving is just 325 calories or 6 Weight Watchers SmartPoints! This Italian Wedding Pasta Skillet does have several components, but you can definitely save yourself some time if making it on a weeknight but prepping some ingredients ahead of time. If you’re looking to prep ahead, you can always chop the onions, carrots and celery ahead of time (I use my Pampered Chef hand chopper) and toss them in a zip-top bag in the fridge until you need them. You can also cut up the chicken ahead of time (I use kitchen shears, I find it’s so much quicker than a knife) and cook the pasta ahead (just take it out of the fridge when you start cooking and stir it in at the end letting it warm through). You can even make and roll the mini meatballs ahead of time and store them in a tupperware in the fridge (or freeze them!) until ready to use. With a little bit of early prep this recipe can come together in no time for a speedy meal on a busy weeknight. 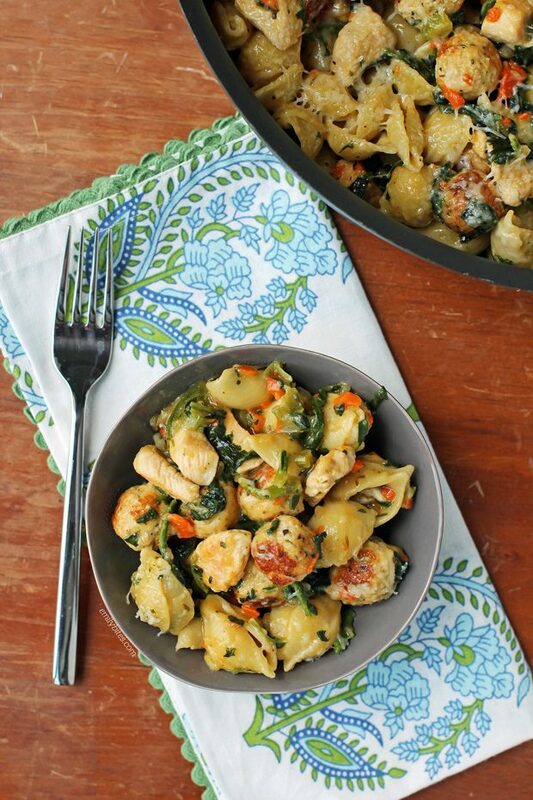 Looking for more tasty lightened up pasta recipes? Check out my Sausage Ricotta Pasta, Lemon Chicken Orzo with Tomatoes and Asparagus, Chicken Pesto Parmesan Pasta Skillet, One Pot Cincinnati Chili Spaghetti Bake, Beef Stroganoff, Beefy American Goulash, Pizza Lasagna Roll-Ups, Chicken Parmesan Stuffed Shells, Slow Cooker Kickin’ Chicken Pasta, Beef and Sausage Manicotti, Pumpkin Alfredo Tortellini Skillet, Spinach and Artichoke Lasagna Roll-Ups, Cheesy Chicken Veggie Pasta Skillet, Spinach and Parmesan Orzo, Sausage Tortellini Skillet, Chicken Cordon Bleu Pasta Bake, Chicken Enchilada Stuffed Shells, Tomato Soup Mac & Cheese, Spaghetti Pie, Spicy Sausage Pasta, Cheesy Taco Pasta and many more in the pasta section of my recipe index! In a large bowl, combine the ground turkey, bread crumbs, grated Parmesan, Italian seasoning, garlic powder, egg and milk. Using your hands (or a spoon) mush all the ingredients together until well combined. Roll the meat mixture into 60 separate (3/4”-1”) mini meatballs and set aside. In a large pot, bring water to a boil and cook the pasta shells according to package directions. Drain the pasta when cooked. While the water boils for step 2, bring 2 teaspoons of the olive oil over medium heat in a large saute pan or walled skillet. Add the chicken pieces and cook, stirring occasionally, until the chicken is cooked through (about 5-6 minutes). Remove chicken to a side plate. Add a tablespoon of the oil to the same skillet and keep over medium heat. Add the mini meatballs and cook for a few minutes, stirring when needed, until all sides are browned and the meatballs are cooked through. Transfer meatballs to the plate with the chicken. Add the remaining teaspoon of oil to the skillet, still over medium heat, and add the onion, carrots and celery. Cook, stirring occasionally, for a few minutes until the vegetables are softened. Add the garlic and stir together. Cook for another minute until garlic is fragrant. Add the chicken, meatballs, broth, condensed soup, chopped spinach, thyme, salt and pepper and stir together until well combined. Cover the pan and cook on medium-low for 2-5 minutes until heated through. Remove the lid and stir in the pasta and one ounce of the shredded parmesan until well combined. Sprinkle the remaining ounce of Parmesan over top of the skillet and replace the lid. Turn off the burner and keep covered for 1-2 minutes until the cheese on top is melted. Sounds delicious, but when do you add the chicken and meatballs back in? Any substitution you could use for the cream of chicken soup? Honestly, I really suggest making it as written – it’s SO good! The finished product doesn’t taste like cream of chicken soup to me. It’s delicious. This was really good! I really loved the flavor. It’s a bit more involved than what I usually make (lots of steps) but it was worth it! I just need to allow more time for prep next time (and there will definitely be a next time!). Kroger sells mire poix mix in the freezer section. It is equal parts celery, onion, and carrots that are diced. I keep that on hand always because it is needed in so many recipes. Thank you Rebecca for this tip! With a two year old it can be hard to prep so the frozen celery, onion, and carrot mix already chopped helped me out big time with this recipe. And thank you for this recipe Emily! It was so good! This was a fantastic dish! I have made it twice already and my husband and I love it! Although, the second time I made it I eliminated the chicken breast I felt it was too much and didn’t have the soft tecxture the rest of it had and so I just baked the 1TBS size ground chicken meatballs. I did not add the Parmesan cheese or celery either. Other than those three things- as it was written the recipe was amazing!